Bald assassins, one-eyed clones, thieving raccoons...it’s hard to deny the delicious diversity of stealth adventures out there for would-be wall huggers to dive into. Sometimes stealth games are a power fantasy, letting you serve the sweet dish of revenge upon your enemies via some of the greatest tools imaginable. Other titles use stealth as a necessary means of survival, where you’re not so much getting the drop on anyone as you are just trying to get as far away from them as possible. While elements of stealth games (mainly the ability to stab people in the back from behind) have ebbed their way into a whole range of other mainstream genres, it is the following titles which deliver the undiluted euphoria of pure stealth satisfaction, with all the accompanying bells and whistles. Technically, The Last of Us isn’t a stealth game (the more officially accepted jargon is action-adventure survival horror), but stealth is such a massive part of the experience that it’s hard to ignore its brilliance. In the plant-ocalypse, where bullets are scarce and friends are even scarcer, stealth is a way of life. Joel and Ellie are almost always outnumbered and outgunned, so getting the jump on their foes, or just avoiding them altogether, is the most effective way of staying alive. This makes for tense, terse stealth gameplay that isn’t afraid to punish your missteps with consequences that will make you wish you had timed that bottle throw with a little more patience. The Last of Us is relentless in its depiction of humanity under pressure, and its stealth mechanics are a perfection extension of that idea. If you’re more of a “sneak to kill” type player, Alien: Isolation probably won’t be your thing. This is more of a “sneak to avoid being impaled by that horrific xenomorph thing constantly hunting me down” sort of experience, melding survival horror with stealth in an effort to take player vulnerability to new extremes. The scares work perfectly in tandem with the sneaking, though, as Creative Assembly experiments with interesting mechanics to keep the game feeling as authentic as it looks. Consider, for instance, the fact that the xenomorph can hear you through your mic when hiding, using the noise to pinpoint your exact location, and you can quickly see why Alien: Isolation might be the scariest stealth game ever made. Few stealth games are kid-friendly, so thank goodness that Sly Cooper exists to teach the PG-13 demographic about the value of slinking and subterfuge before they jump into the wider pool of R-rated skulking. Looking back at Insomniac’s back catalogue of titles, Sly Cooper: Thieves in Time stands tall as a recent highlight. The fourth major adventure utilises great platforming, mechanical variety and relentless charm to mould an adventure that’s as endlessly affable as the starring raccoon himself. The depth of the stealth itself has its limits, but Sly 4 makes up for it with a generous heaping of gameplay goodness across all other aspects of its design. Come for the silly jokes, stay for just about everything else. Sam Fisher has come a long way since the original Splinter Cell of 2002. There’s been a few bumps in the road, sure, but Splinter Cell: Blacklist, the 2013 spin-off to Tom Clancy’s all-American source material, is evidence that Fisher has a bright future ahead of him. Blacklist earns its place here for the steps it takes to move the franchise forward, imbuing Fisher with a renewed sense of mobility while returning to the stealth-focused maxims of Splinter Cell: Chaos Theory. The freeform controls do a good job of making Fisher operate like the veteran field agent that he is, and the clear dedication to presentation and storytelling makes the whole thing feel like your favourite action thriller TV show. With Blacklist being one of the last big games for the PS3 and Xbox 360, Ubisoft needs to hurry up and finally bring Splinter Cell to the next generation. The increasing unlikeliness of a final instalment in the planned trilogy for the rebooted Deus Ex makes me very sad indeed. 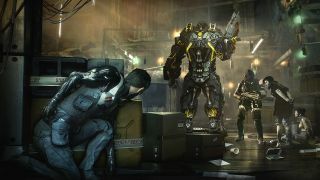 What Eidos Montreal had achieved with the first title, Human Revolution, was phenomenal, but Mankind Divided took two augmented leaps further to execute sci-fi stealth on a scale that hadn’t been seen before. Open combat is, as always, an option for walking gruff-bag Adam Jensen, but it's sticking to the vents and conveniently placed pieces of cover in Mankind Divided that remains the most rewarding avenue for progress. This is a stealth game where you can hack into someone’s office, find the password for their colleague’s computer on a sticky note, log on and wire their bank account credits to spend on a new tranquilizer gun with which to take out that very same person. If that doesn’t appeal to you as a stealth fan, I’m not sure what else could. You have to give kudos to Klei Entertainment for making a side-scrolling game that feels just as satisfying and cognitively stimulating as some of the best stealth games out there. In fact, the beauty of Mark of the Ninja isn’t in spite of its two-dimensional constitution, but precisely because of it. That unconventional perspective forces players into new modalities of thinking, with puzzles and platforming becoming an integral part of the experience. The animation is also, as you may have guessed, staggeringly gorgeous, dense with painterly textures and brooding backdrops. It doesn’t get much better than this. There’s nothing quite like a Hitman game. Eschewing from traditional genre templates, Hitman has always been about getting by unnoticed in broad daylight rather than sticking to the shadows, and IO Interactive’s latest episodic installment takes this design philosophy to new heights. All of Hitman’s six main locations are massive, sprawling hubbubs of activity and opportunity, teeming with the potential for unique executions and dark humoured takedowns. It’s a globetrotting epic that modernises the power trip of being Agent 47 with aplomb. We can thank the stealth gods, then, that IO has managed to hold on to the Hitman franchise after parting ways with Stealth Enix. What can be said that hasn’t already been said about Dishonored 2? After such a superb foundation in the original Dishonored, it was almost inevitable that Arkane’s follow up should be a home run, and that’s exactly what we got in 2016. Dishonored 2 is a sequel that, aside from its wanting story, builds upon its predecessor in almost every conceivable way, while attaching a smart assortment of new ideas to the framework at the same time. Throw in Arkane’s natural knack for unprecedented world-building (Karnaca is a mediterranean dream of a sandbox), and the ever-pervading themes of political conflict and religious iconography, and you have a stealth game that’s only a few inches shy of perfection. Dishonored is amazing and all, but it owes a lot of its existence to Thief. No, not the half-baked remake from 2014, but Thief II: The Metal Age - the series’ seminal masterpiece as developed by Looking Glass Studios. As one of the first stealth games to offer open-ended levels, responsive first-person controls and genuinely emergent forms of gameplay, Thief II paved the way for future titles of its kind to flourish the art of the modern stealth experience. That’s not to say the game's lost any of its original appeal, either. The impeccable sound and visual work preserves Thief’s world to be as captivating as it was seventeen years ago, and that very same freeform design has kept its replay value alive and well to this day. I’ll be straight with you: I still don’t exactly know what happened in The Phantom Pain (something to do with flaming unicorns and skin-breathing snipers, I think? ), but it doesn’t matter. Every minute spent in Kojima’s swansong for the Metal Gear franchise is a minute of stealth gaming heaven, with Snake at the top of his form. As the most expansive Metal Gear game yet, The Phantom Pain excels through its generous feeding of choice to the player. The Venom Snake in your save file is your Venom Snake, who approaches each task however you want him to, equipped with whatever and whoever you want him to use. It’s Metal Gear writ large, and it’s truly glorious.